This week each of the FDLT Year 2 visited art galleries to explore how learning can be inspired and developed in locations other than the classroom. The UN group travelled to Avenue Campus to look at the exhibition ‘Under Construction’. This is an exhibition of photographs taken by the second year BA Hons Photography students and records the changing environment of Northampton. 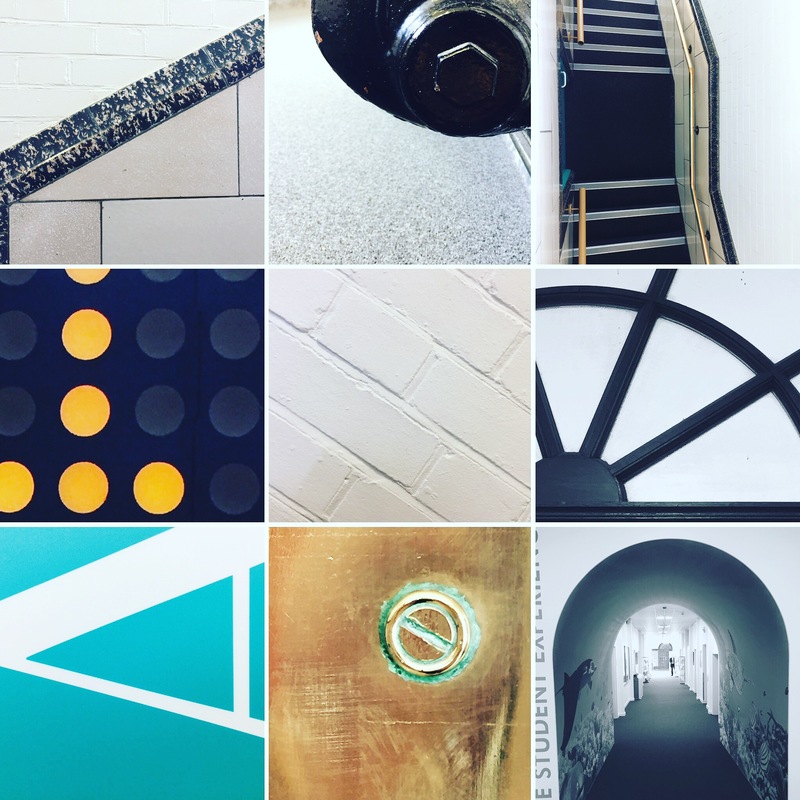 This year the photos were taken at the old Royal Mail sorting office and development of the new Waterside Campus. 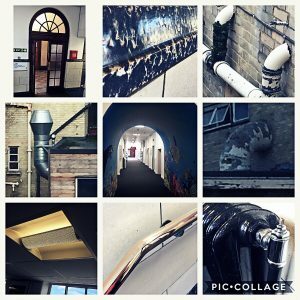 The group explored how the exhibition could be used to support learning in art and across the curriculum and then went on to take their own photos around a theme or idea of their choice. They chose and edited their photos on their phones or tablets, presenting them as photo collages. The Leicester group visited New Walk Museum and Gallery in Leicester. They explored the collection of Victorian and modern paintings, trying out starter activities to get pupils used to being in a gallery and focused on art and identified and discussed pictures that could be connected. One of the travelling exhibitions at the gallery was ‘Sublime Symmetry‘. This was an exhibition by the William de Morgan Foundation and was focused on art and mathematics. There were resources for younger pupils to use (hanging up in activity bags), Key Stage 2 mathematics exploration workbooks and art leaflets: some of the supporting resources can be seen here. The students could also explore the dinosaur display, the Ancient Egyptian section and a hands on science exhibit. Some of the discussion in these session will help them work on assignments in their enriching learning beyond the classroom module. This week in Year 2 of the FDLT course we have been exploring the making of digital books by educators to use with their pupils or by pupils supported by their teachers and TAs. Exploring some examples was a useful way in to this session and these can be seen on a Padlet. In the session each group used the BookCreator app to make a collaborative book. The BookCreator app is quick to learn to use and has lots of potential. In this first experience we only used the tools available within the app but many other tools and apps can be used with the digital books made in BoolCreator. There’s a basic introduction to the app at this link. In order to make a successful collaborative books some joint planning needs to take place. One key decision to make is whether the pages should by portrait or landscape. If pages are to be made on separate ipads and then combined in one book then the page orientation must be the same. The language features of the book must be discussed so that they match the purpose and audience of the book. The Y2 students were making a book to inform and advise new FDLT students about their course and where it takes place. A list of possible pages was made from which pairs of students could choose. Students could then use any features of the app to create their page. This included choosing a blank page to work on or a comic panel page; using audio, video and photos; choosing font, colour and size as well as page colour. After each page was finished they were airdropped to the tutor ipad where they were combined in to one book. The books can be seen below as YouTube videos. In the near future there will be more sharing options from the app which could be more book like in nature. There are so many possibilities for using the making of our own personalised digital books to support learning or create meaningful learning opportunities – its a tool well worth exploring. I recently came across an interesting link on Dylan Wiliam’s Twitter feed. He was recently interviewed by a maths teacher, Craig Barton, and this interview is available for you to listen to as a podcast on his blog: MrBartonMaths. “On this episode of the Mr Barton Maths Podcast, I spoke to Dylan Wiliam. Quite simply, Dylan is one of my heroes. He was the inspiration behind my Diagnostic Questions website, and his many books, presentations and writing that I have eagerly consumed over the years have always left me filled up with new ideas to try in the classroom. Many of you are working on your PDT 1004 Pupil Assessment assignment so you might find this podcast both interesting and useful. If you click on this link it will take you to the podcast – scroll down to the bottom of the page. Dylan Wiliam is @dylanwiliam on Twitter and Craig Barton is @mrbartonmaths. If you are in FDLT Year 2 you will be considering how the curriculum is organised this term. You may be searching for reading about how subjects can be connected to together in a connected or cross curricular approach. There are some videos that you could use as background available on Teachers’ Media. You will need to log in to gain access to all the available resources. Searching this site could give you access to examples from practice to support your PDT 2015 AS2, especially of your own experience of a cross curricular approach is limited. As you watch you will need to analyse and draw inferences from the material to the requirements of the assignment, with its focus on English and mathematics, and their potential to be connected to another subject. If you are investigating mathematics and its connections to other subjects you might also find useful material on the motivate website. 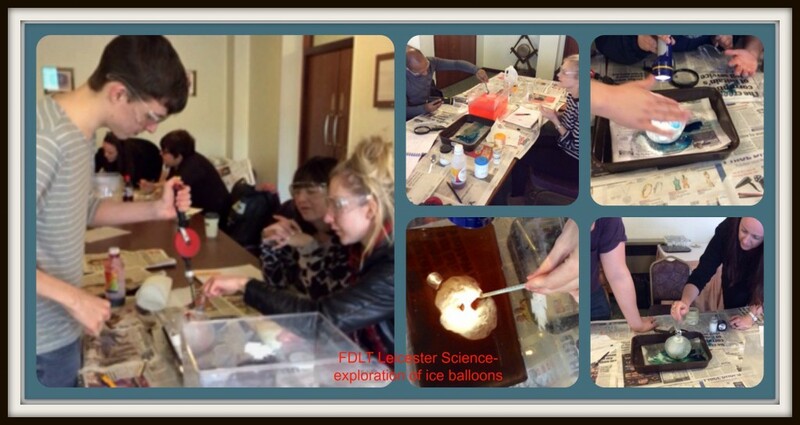 Exploring science in FDLT Y1 1! The Y1 students have been enjoying their science sessions this month. Here is a ThingLink that Wendy Yarnall, one of their tutors made, about exploring ice. Here are some photos of the Leicester group in their ice session. 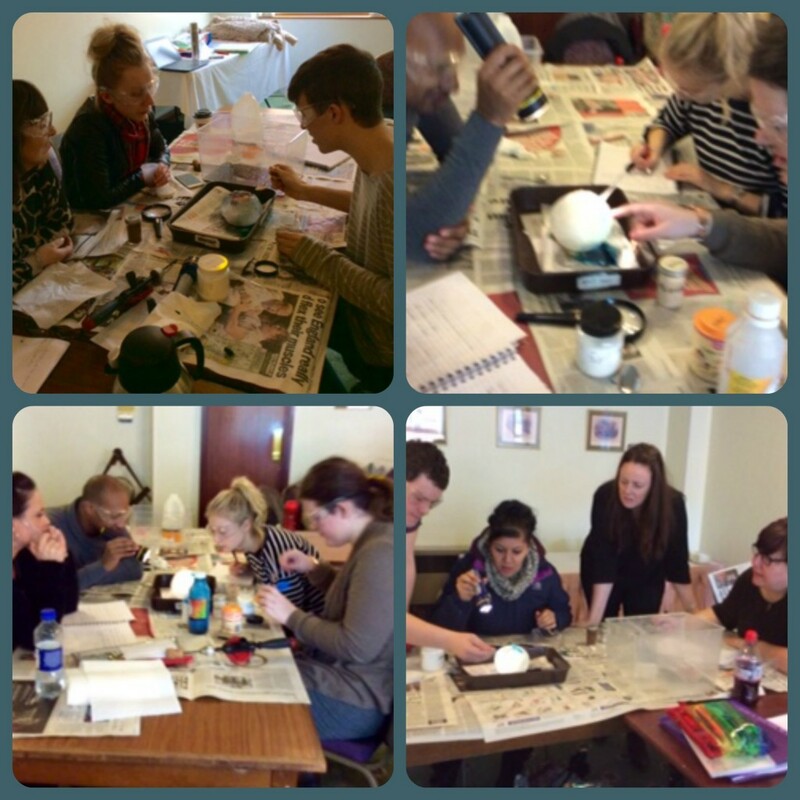 The students have been exploring how to support learning in science and trying out exciting activities to stimulate pupils’ curiosity. October is the month of the The Big Draw in the UK and all over the world. ‘The Big Draw is the world’s biggest drawing festival with thousands of enjoyable, and mainly free, drawing activities which connect people of all ages with museums, outdoor spaces, artists, designers, illustrators – and each other. You can look here resources and ideas to help you join in with The Big Draw in schools. You can look here for events that are happening near you in galleries, museums and other places. If you or your school are taking part do add a comment below to share with us what you did.